I wanted this to be a really smooth guitar, with lines flowing naturally from one to the next. I spent a lot of time sanding and went back over the course of a week or two refining the curves. For the first time I used my drill press like an arbor press to insert the frets, and did all the frets with the fretboard off the neck. I also decided to bind the neck with ebony so it isn’t readily apparent the neck is bound unless you look closely. I started thinking about Fall and Fall colors, Halloween coming in a few weeks… The brown in the ebony fretboard led me to choose Thuya burl for the headstock inlay. I put in an ebony inlay for the first time, around the perimeter of the headstock. I didn’t realize that I wouldn’t be able to bend the inlay around the curves! I ended up hand cutting the curves at the base of the headstock from leftover fretboard wood, using an inlay saw. I cut the slots for the tuners using my little Harbor Freight mini mill. That mini mill comes in handy for so many things. 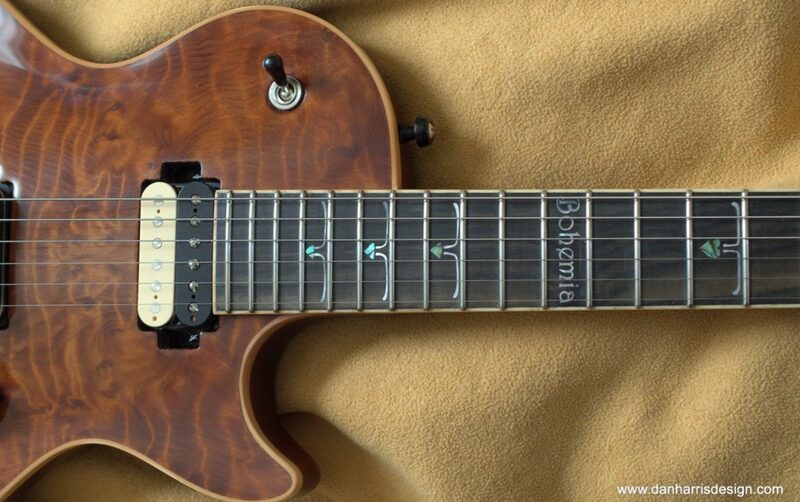 I chose to use the ebony fretboard with the swoop of brown coloring. I discovered that it had a natural dot and I oriented it so that this dot was at the 12th fret- a natural octave marker! I cut the space out for the neck in the body. This has an extra long tenon which terminates at the bridge pickup cavity. I really didn’t want to put in a neck reinforcing rod, but decided at the last minute to do so. I think the 5 piece neck with the thick ebony fretboard would’ve been OK, but I chickened out. I discovered “Thuya Burl” at my local exotic lumber supply and chose to use it as the headstock inlay. Once I had my basic shape I cut out the top and bottom of the body and then started shaping the neck. I discovered that I had to be careful because the mahogany is much softer than the maple or ebony- it is easy to trim more mahogany than ebony, leading to flat spots on the neck. I was originally planning to make another LP style guitar, but chose instead to make an original body design based in part on guitars by Michael Spalt and Steve Klein. I drew a sketch freehand on a piece of tracing paper and put another piece of tracing paper atop the first, modifying my sketch until I had something I liked.